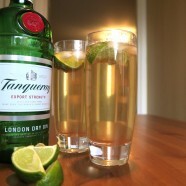 Home » Featured » Is it gin o’clock yet ? Is it gin o’clock yet ? Its important to remember that our breaks away in the ‘van are a family adventure. But both Angela & I enjoy a drink to unwind with when we are away but what is our favourite tipple ? Apart from the occasional glass of wine and fine ale we don’t actually drink that much. However, the one drink that both Angela and I enjoy is Gin with Ginger Ale. Its refreshing, its warming, its perfect for cold nights in and warm nights out. So here is the recipe. Cut a lime into 8 segments, gently squeeze one segment to release some of the juice into the glass and drop the wedge into also. Add a couple of ice cubes, and top up with Ginger Ale. Remember Ginger Ale is not as fiery as Ginger Beer, but if you do like Ginger beer – there is no reason why you cannot swap them over. And that’s it. Its possibly one of our favourite drinks at the moment and while we were away recently we invited over some of our caravan neighbours – who really enjoyed the drink, despite not being fans of gin ! So, what is your favourite drink while camping? Cheers !! Sounds nice. Haven’t tried gin with ginger beer (only vodka). Have you tried Fever Tree mixers? They’re delicious, and have got me hooked on G&T – at home or away. Yes we love Fevertree here. We used the Fevertree with the Ungava Canadian Gin. Its possibly the best combination ever !. Also have a look for the 1724 tonic. That is pretty special one too. Who would have thought tonic’s would be so different eh ? Enjoy your G&T John, and many thanks of the comments. Have you tried many of the craft gins about nowadays? I can thoroughly recommend Cotswold Gin – no hangover involved!